Tooth design utilizes sharper tooth geometry for faster cut rates. Aggressive shank angle increases tooth contact, maintaining cutting speed as blade wears for longer blade life. Anti-stick coating minimizes friction and gumming. 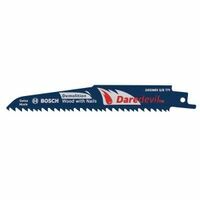 Bosch Reciprocating Saw Blade, Series: Daredevil, 6 in Length, 0.062 in Thickness, 5/8 TPI, Variable Gullet Teeth, Bi-Metal Body, Titanium Coated, Blue, Applicable Materials: Wood With Nails Reinforced tooth for increased durability when cutting through nails and other foreign objects. +6 degree hook angle for fast, aggressive cuts. Anti-stick coating minimizes friction and gum-up. Raker tooth design increases the tooth contact area for faster cuts. Applications: General Purpose Fast Cutting In Wood. 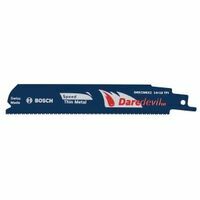 Bosch Reciprocating Saw Blade, Series: Daredevil, 6 in Length, 0.035 in Thickness, 14 + 18 TPI, Bi-Metal Body, Blue, Applicable Materials: Thin Metal Bosch Reciprocating Saw Blade, Series: Daredevil, 6 in Length, 0.062 in Thickness, 8 + 10 TPI, Bi-Metal Body, Titanium Coated, Blue, Applicable Materials: Metal, Aluminum and Other Non-Ferrous Metals Reinforced tooth for increased durability when cutting through nails and other foreign objects. +6 degree hook angle for fast, aggressive cuts. Anti-stick coating minimizes friction and gum-up. Raker tooth design increases the tooth contact area for faster cuts. 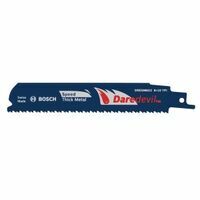 Applications: General Purpose Fast Cutting In Wood.